Super cute Hoodie for your dog made from classic sweatshirt fabric in 4 great colors. The pocket on the backend completes the look. You will love the way your dog looks in this great sweatshirt. Ideal for city walks on dry chilly fall and winter days where you just need a bit of protection or for wearing in the house. Suitable for long term use as there is nothing to rub or chafe the skin. Comes in 8 sizes: 14" - 28". To determine which size your dog needs please measure from the breastbone in front, along the side to the base of the tail. 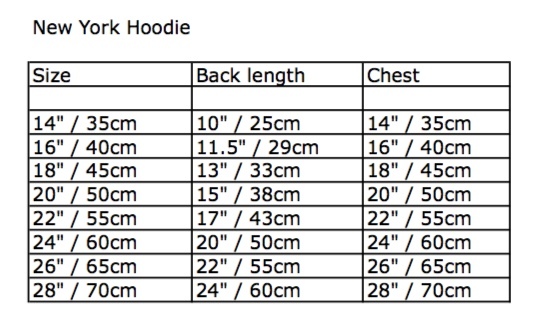 The size of the Hoodie should be the same as the dogs measurement. If you have a female and want extra coverage go up a size. These can't be customs made, but size 28" will be big enough in the chest for your dog. My Doberman wears size 28" and her chest is bigger than 30" and the Hoodie fits her perfectly.